Man, am I glad to have Stacy Lee back on art duties. For anyone who isn't aware, for the longest time, the Silk book's been stuck with Tana Ford on art, and to put it frankly, I think her art looks pretty bad. And while the next few issues are looking like they'll feature Ford's return, for now, we can enjoy another great issue drawn by Stacy Lee, the original artist behind the initial run on Silk. And, for their first issue back since the end of Spider-Women, this issue's pretty solid too. This issue features Silk having to maintain her cover with Black Cat while also having to deal with her slowly-crumbling relationships with other people. It's a fairly emotional issue, with the book dealing with just how hard it is for Silk to really connect with others, especially when she has to not only maintain a secret identity, but on top of that, remain undercover. It becomes most poignant when she tries to reconnect with her ex, Hector, only to find that the only address of his she had was outdated, him having moved out months ago. It actually really reminds me a lot of some of the best Spider-Man comics and stories. Those stories were not only great because of the superheroing, but because Peter Parker had to maintain a life while still being Spider-Man. This issue even gives us a chance to know Black Cat a little better by giving her and Silk time to connect while they're stuck in an elevator shaft. It also makes the ending such a great twist, and a great way to really set up the drama for what's looking to be the final confrontation between these two, who'd been going at it since Silk's pre-Secret Wars series last year. It's honestly one of the best issues of this series that they've put out in a while. I await the next issue with feverish anticipation. Gillen's Darth Vader series is currently winding down, with the series set to end at #25, but with that being said, Gillen seems determined to go out with a bang, as this issue backs Vader up against the corner, with everything going wrong. Betrayed by a former uneasy ally, Vader is forced to face the sinister machinations of one of the would-be replacements for him, a woman obsessed with the powers of technology and science over anything abstract like the Force. And she is only the first of Vader's obstacles. 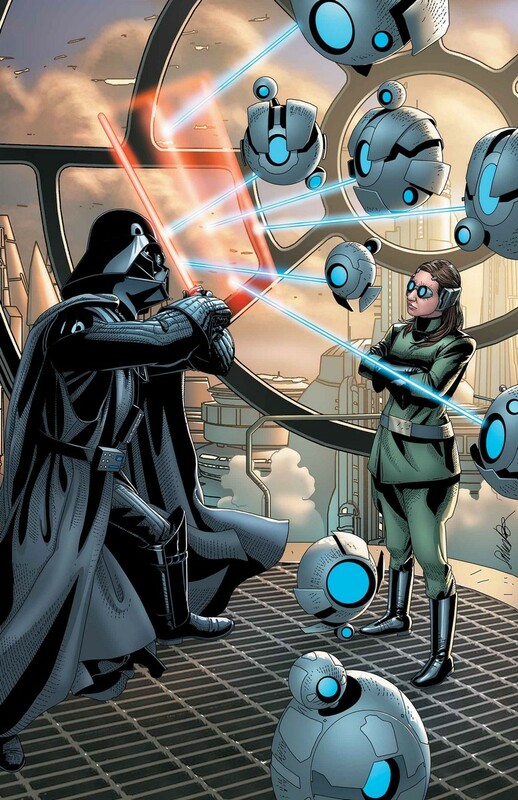 Meanwhile, the sadistic droids, Bee-Tee and Triple Zero, have captured Vader's other former ally, Doctor Aphra, and are trying to bring her in to probably be tortured and executed. That is, unless Aphra has anything to say about it. It's an issue with a lot happening, and at times, it does feel like it's coming pretty fast. I did manage to keep up, though, and the confrontation between Vader and the mastermind behind these mechanical monsters is really quite tense. 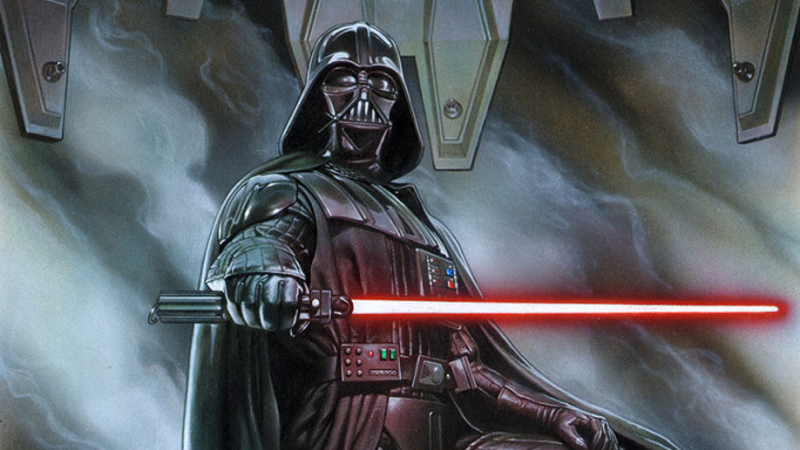 The dire situation Vader finds himself in by the end is also quite exciting, and while the next issue tease shows that it's maybe not as dire as it seems, it's still a rousing cliffhanger. I'm excited for the next issue, but bummed that this series is about to come to an end. 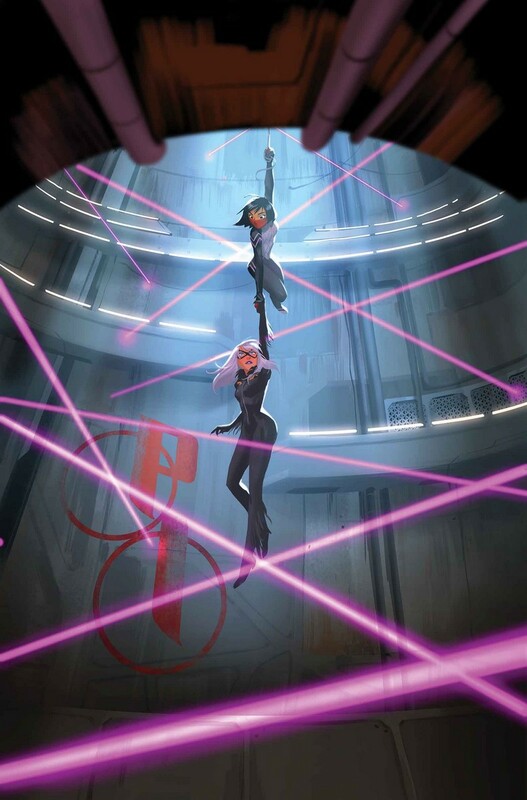 If the stakes are really as high as they're seeming, though, it'll be quite an exciting finish for the series, and an achievement for Kieron Gillen. In many ways, this is the perfect miniseries for anyone who was introduced to both the Daredevil and Punisher characters through the Netflix show. Not only are the characters essentially the same between the two, but many of the themes being examined, mainly whether or not it's ethical to kill, are the same ones from that show. What puts this comic at a slight disadvantage, though, is that this isn't the first comic, nor even the first Daredevil and Punisher comic, to explore this idea. What we have here is an all-around serviceable story that won't do much if you're already familiar with this story, but is perfect for someone new to Daredevil comics, and even veteran readers might get a kick out of Soule's writing. 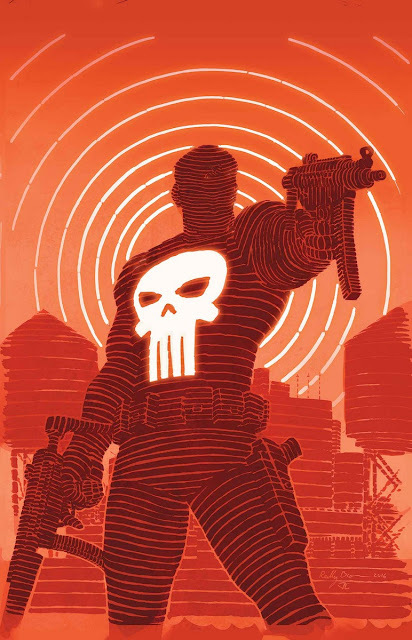 This issue sees Daredevil and Blindspot trying to protect a Russian criminal from the gun barrel of Frank Castle while trying to get him to the airport to see his day in court. The trouble is that letting him have his day in court means almost certainly letting him get off. This is where the ethical debate comes in, as the duo tries to face Punisher and keep him away from the defendant, while Punisher chides them for being blind heroes who believe they're doing good. The interesting part comes from the fact that Punisher seems to be more interested in telling that to Blindspot, who's more of a newbie to the game. Daredevil is mostly busy facing some goons trying to rescue the defendant, who's a fellow gang member. What you get as a result is a quite enjoyable game of cat and mouse, even though what's going on is really par for the course for these kinds of stories. That being said, it's still a very well written tale, and Soule has not steered me wrong much since taking over a lot of books over at Marvel. Man, Miles REALLY can't catch a break these days. 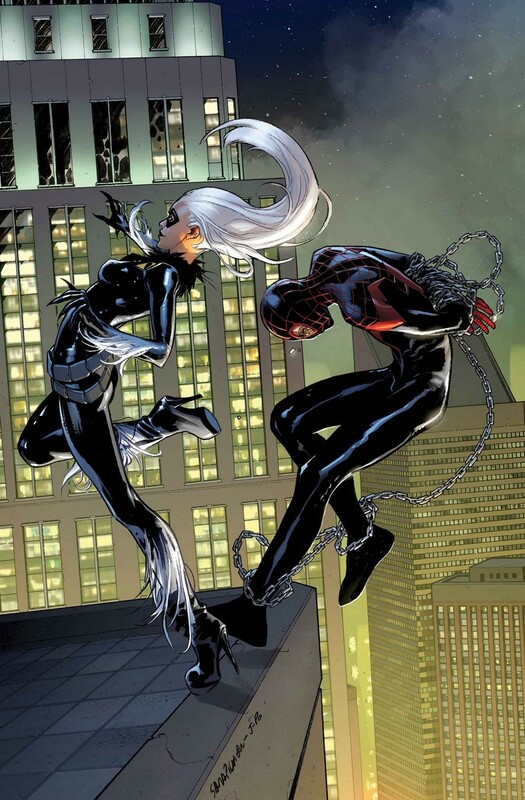 After last issue had his friend reveal his identity to someone and have Miles himself be knocked out by an ambitious crime boss in Black Cat, now he's the Cat's captive. And what's worse, his parents (or at least his grandma) can sense something is up. Most of this issue is Ganke and the person he revealed Miles' identity to, Goldballs from the X-Men, or Miles having to deal with Black Cat, Hammerhead, and their goons. It's a fairly standard issue, and a the conflict with Miles actually kinda gets diffused surprisingly quickly. What is interesting about that is that, by the end, the reason behind this ends up becoming one of the big teasers for the ongoing story. There's also another nice teaser at the end involving a new character. Though, frustratingly, I have a feeling that we won't get any follow-up on it next issue since the next issue is the Civil War II tie-in and Bendis will probably want to save it until after that's wrapped up. But then again, Bendis is also writing Civil War II, so I have no idea what to expect. Aside from all that, we get some more funny dialogue with Miles' grandma, who's stereotypical Latina grandmother antics being all the funnier to me considering I know a lot of people like this. It's not really an issue that gives a TON to chew on, but it's decent enough. That being said, I hope the break from the main story gives the book some time to breathe and create a real story to be interested in, because otherwise, it's a book at risk of feeling aimless. That's it for me this week. Again, sorry for the shorter installment this week. Next week, I'll be back with a pull as big as we've grown used to, so until then, what are you reading? Short week for you too, or is Civil War II keeping you busy? Let me know in the comments below, and I'll see you next time.